The dairy industry is an important part of our life at Frazer. We’ve been serving and helping dairy farmers and milk production professionals for more than half a century. We’re adept at dairy tax planning, accrual-based financial statements and entity formation – all of which allows you to focus on running your operation. In addition to our dairy tax expertise, we’re also there to cover the range of strategic planning that your business requires, and that you demand. Two times per year Frazer, LLP produces its Dairy Farm Operating Trends, recognized as the top industry source for relevant dairy statistics. The data is compiled from dairy operations in California, Arizona, Idaho, New Mexico, Washington and Oregon. This publication is designed as a reference tool and a management aid for dairy farm managers and advisors. This report is provided to and widely utilized by dairy farmers, lending institutions, universities, colleges and other agribusiness industries. Members of our team are frequent authors for industry publications, including Dairy Business West, Progressive Dairyman, and Dairy Today eUpdate. 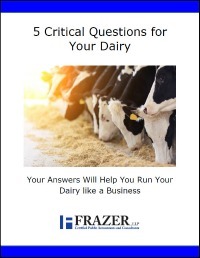 If your primary focus is dairy farming, or milk processing and distribution, Frazer’s team of experts will add a wealth of knowledge to your own team. Frazer LLP: With You. For You. Webinar: How Do World Markets Impact My Dairy? Presented by Frazer, LLP; Commodities Plus; and, High Ground Dairy Risk Management. The March 12, 2018, issue of Progressive Dairyman features our annual regional snapshots of “the state of dairy” around the U.S. Expanded reports for individual regions are highlighted in this online series. The Tax Cuts and Jobs Act signed into law on December 22, 2017, is the largest overhaul of U.S tax code in 30 years. Most of the tax-cut provisions are effective immediately for tax year 2018. However, many are temporary and scheduled to sunset or phase out in future years, if no further congressional action is taken. We believe the new law has many tax advantages that will be beneficial to the majority of farmers and dairymen. It’s that time of the year to start thinking about taxes for 2017. So what’s new for 2017? Read this article to learn about the proposed changes and how they affect you. Employee management is key in any business’ success. This is no secret and having motivated, knowledgeable and happy employees with real room for growth and advancement in their fields always adds to the bottom line. Read this article for two ideas to simplify the employee and immigration system. There are two very generous tax breaks business owners have relied upon: bonus depreciation and Section 179 expensing. Read this article to learn how these tax breaks may impact your dairy as well as the new tax return filing deadlines. It is important to understand the business finances of your dairy. Financial records are used to track the performance of your operation. There are generally three objectives of maintaining these records: profitability, reduction of risk and liquidity. Read this article for a description of how to conduct a financial analysis of your dairy. With pregnancy rates, facility constraints, feed availability, lending relationships and working capital in play, there are many factors that need to be considered when developing a game plan for your heifer-raising operations. Read this article for five important questions for your heifer program. Volatility remains a constant challenge in today’s dairy business. Rapid fluctuations in commodity prices and milk markets require constant monitoring and informed decision making. Read this article for smart and effective cash management ideas, which are essential to keep your dairy running as smoothly as possible. On December 18, 2015 President Obama signed into law the Protecting Americans from Tax Hikes Act of 2015, which not only extended 50 tax provisions but made some of these provisions permanent. Read this article to learn more about Section 179 Expensing, bonus depreciation, and other PATH Act tax provisions. With the growing costs of utilities, more dairy owners across the nation are turning to renewable energy alternatives. There are many benefits to using renewable energy, such as the long-term savings, less maintenance, decreasing your carbon footprint and even saving money on your taxes. Read this article for information on energy tax credits and other incentives. It’s here! The new paid sick leave law signed by the governor last September took effect on July 1, 2015. With a few exceptions, California employers must allow their eligible employees to accrue at least 24 hours or three paid sick days per year paid at the employee’s regular paid rate. Read this article for the answers to the most frequently asked questions. Although El Nino may help, it has always been just a temporary solution for the West, as drought years will continue to persist in greater numbers than wet years. Water management practices and new technological solutions are the only real answer. Read on. Retirement is not an easy decision to make. Most farmers and ranchers have been farming most of their lives, and just the thought of retiring from the work they love is difficult. Once you’ve crossed that hurdle and decide to retire, what do you do with the farming business? Read this article for a few options. Starting July 1, 2015, California employers must allow their eligible employees to accrue at least three paid sick days per year. The new law was signed by California Governor Jerry Brown last September. The law as well as posting requirements became effective January 1, 2015. Read this article to learn how it works. Using an intentionally defective grantor trust (“IDGT”) might just be the estate planning tool you are looking for. An IDGT is an estate planning tool used to freeze certain assets of an individual for estate tax purposes but not for income tax purposes. Read this article if you want to make sure your assets are passed down to your children and not Uncle Sam by using an IDGT. As a manager or business owner of a farming or dairy operation, it is important that you understand the labor laws that may affect you and your employees. The IRS has specific rules and regulations that affect all employees in the agriculture industry. Read this article for important points to consider. Milk income remains one of the dairy industry’s greatest drivers of profitability, often leading to the common question among dairy producers, “How many cows should I milk?” The answer is not as simple as it seems; I think the real question is, “What business model is right for this dairy?” The number of cows is a major part of every dairy’s business model, but it is not the only part. Read on. Feed costs are the largest cost of production for a dairy operation and play a key role in getting your company the best bottom line. Knowing your costs will help you decide which crops to grow, what quality of feed you need and how much is needed to match your feeding rations. Read this article for ideas on how to track crop costs. The Tax Increase Prevention Act of 2014 extends certain expiring tax provisions relating to individuals, businesses and the energy sector. The bill only extended to 2014 and expired on December 31, 2014. Therefore, it is only a temporary tax break for one more year. Read this article to learn about potential tax breaks for farmers and dairymen. Under the employer mandate you must have an insurance policy available; offer the insurance to employees, which they have the option to accept or decline; and, make it affordable. Is it better to offer coverage or pay the penalty? Read this article to help you decide. The employer Obamacare health insurance mandate goes into effect on January 1, 2015 for employers with more than 100 full-time equivalent employees. This means that employers must offer health insurance for all their employees or pay an employer shared responsibility payment, referred to as a “fee” which is a penalty that is not tax deductible to the employer. Read this article to learn how this impacts your dairy. Your personal residence is one of your most valuable assets. With rising home prices, transferring a residence to a qualified personal residence trust (QPRT) becomes a popular estate planning technique. When properly structured, a QPRT freezes the value of the residence at the time the trust is created. This results in significant estate tax savings and also helps to keep the value of many estates below the taxable estate threshold. Read this article to learn how QPRT works and other considerations. If you are making milk these days, then you are making money. Now that there is some extra cash in the bank account, the question is: What to do with it? The answer is: “It depends.” Read this article for a few alternatives and how to take advantage of the margins now to better your position later. There has been a lot of talk about the Margin Protection Program (MPP) introduced in the new Farm Bill. The MPP replaces the Milk Income Loss Contract (MILC), Dairy Product Price Support Incentive Program. These programs were considered mostly ineffective because they focused solely on prices and not costs. As most dairymen know, this logic is flawed. The industry has seen drastic volatility in the feed marketplace with break-even prices rocketing higher for most producers in the last 10 years. Read this article to determine whether the MPP is a solution or another so-called “safety net”. For a consultant or consulting team to be effective, they must respect the knowledge of other consultants involved with the operation. Read this article for guidelines on conducting meetings with your dairy consulting team. Milk checks in 2014 look like they will more than cover my feed and operating expenses. Since this hasn’t happened for some time, and since I’m still gun-shy after 2009, how much cash should I hold liquid in a bank account after I pay some bills and build back a little equity? What should I do? Read this article for Bob Matlick’s response. If you own a business as an individual, or are a partner or member in a partnership or limited liability company (LLC) using a cash method of accounting for tax purposes, there is immense value in controlling your own tax fate. Ideally, wouldn’t everyone want to control how much – or how little – they pay in income taxes to the IRS or state taxing authority? Read this article to take matters into your own hands and regulate how much or how little you want to pay in taxes. The Affordable Care Act, which is better known as Obamacare, was signed into law on March 23, 2010, and was upheld by the Supreme Court on June 28, 2012. Regardless of where you stand on this issue, the most controversial requirement of Obamacare will take effect on January 1, 2014. Read this article to learn more. Most of you have heard a lot about the Affordable Care Act (commonly known as “ObamaCare”), but recent changes may have raised more questions. Read this article for a summary of the most important tax developments occurring in the past three months that may affect you, your family, your investments and your livelihood. of equity, and the statement of cash flows. In addition, dairy financials usually include supplementary schedules such as a schedule of farming operations, operating expenses and statistical data. Read this article to understand how each of these relates to the other and the information to take away from each. I have seen many of my dairy farmer clients negotiate hard on feed and supply purchases—sometimes down to what seems like pennies. They have squeezed, skimped, or just plain dropped many expense items. Rarely, however, do I have a client react to the ‘top line’ of the income statement when finances are a struggle. Read this article to consider evaluating your income rather than your expenses when the checkbook gets tight. Many dairy operators want to look at benchmarking or peer-group statistics to identify weak spots in their own operations. Read this article to learn the importance of benchmarking against your own dairy operation to make continual improvements. The American Taxpayer Relief Act of 2012 was signed into law on January 2, 2013. Read this article for some of the changes you should be aware of in 2013. President Obama signed the 2012 Taxpayer Relief Act into law on Jan. 3, 2013. The Act will impose tax increases affecting about 2% of individuals and 3% of small businesses, and makes other changes to the tax code. Read this article to learn how the new law could directly affect you and your business. By the end of 2011, the dairy industry thought it had taken a turn to better days, but instead it was just a “U-turn” to higher feed prices and dropping milk prices in 2012. Some operations still experiencing weak legs from the 2009 downturn might not be able to pick themselves up off the mat this time. Read this article if all of your options have been exhausted, including reorganization under Chapter 11, about the tax implications of liquidation. With the uncertainty of market conditions that many dairy farmers are facing today, saving a dollar here and a dollar there is more crucial to the survival of the dairy operation than ever. Many dairy farmers have looked at their operation with a fine-tooth comb and made the tough decisions on where to cut expenses. Read this article for a proactive approach in minimizing your tax liability. The federal lifetime exemption of $5 million per person is set to expire on December 31, 2012 and revert back to $1 million per person. This is a ticking time bomb for most farm estates in this country, as a $1 million gift exemption really doesn’t go very far in succession planning. Read this article to learn how estate and succession planning can be beneficial and possible with the right team in place. Working capital is the amount of readily available cash a business has available to meet its operating needs and any unexpected volatility related to its own business cycle. In the past, a dairy producer has relied on bank lines of credit for his or her working capital needs. With increasing volatility in the milk output and feed input side of the dairy business, a dairy owner should be keenly aware of his own personal working capital position. Read this article to accomplish this by forecasting business operations. If I think about my 34 years in agriculture finance and consulting, I realize running a dairy is now a business, and not just a way of life. To be competitive, producers must understand air and water regulations, labor laws, cash flow projections, hedging on futures exchanges, and how international markets affect local markets. Read this article for Bob Matlick’s thoughts on the issues of running a dairy business. I see many producers who keep immaculate herd, reproductive and production records; however, many of those same producers have poor quality financial and money management records that may in turn lead to poor business decisions. I will many times drive home asking myself this very simple question, “Why?” Read this article to learn why financial records, both historically and looking forward, is critical to manage your dairy business. Does your dairy operation have enough cash and available credit to make it through a downturn before hitting certain loan-to-value (LTV) limits? Dairymen should be asking themselves how long it will take before banks are unwilling to extend any further credit. Read this article to learn about the value of a cash flow projection for your dairy. Do you have a business plan, a marketing plan or a liquidation plan? In general, agriculture has always been a price taker (in both inputs and outputs), and dairy is no exception, perhaps even the leader. When milk price volatility brings negative margins, the typical producer seems to focus on cost cutting, as opposed to revenue generation. The cost cutting is then usually done without a plan and is more of a knee-jerk reaction. Read this article to learn how to reduce the risk associated with areas under your control, such as inputs and outputs, by creating a business plan for your dairy. The dairy industry has suffered record losses since the Great Depression in 2009. This year is one that everyone wants to forget. Have we recovered from such large losses? Read this article for ways to increase production and manage feed rations to combat lower milk prices and higher feed prices. Producers have a different risk profile based on their own balance sheet, management style, banking relationship and overall personality. Read this article for information about developing a business and marketing plan for your dairy that projects your individual operation for 12-24 months. The plan should include anticipated milk production, any herd increase or decrease, seasonality of milk production, anticipated feed costs (including physical hedges-inventory and forward contracts), capital improvements and debt structure.